HubSpot and Marketo are two of the more well-known marketing automation tools available. Both are publicly traded companies, both have their pros and cons. So which is better for your business, HubSpot or Marketo? We divided the information based on pricing, required commitment, features, the onboarding process, and common shortcoming according to reviews. Research focused on finding reliable market reviews in order to get a more holistic view of the companies. Both companies have a three tier pricing system, and below I have listed their base prices. With HubSpot, I have included their onboarding fee as their website states it is a requirement. Marketo does not state an onboarding fee, though if you look at the price differential it is likely just baked into their monthly fees. Along with these prices, additional charges may apply for extra features. Keep an eye on your needs and take the pre-sales process to understand where you may be upsold and thus end up with a larger bill than you may have budgeted. Because HubSpot sends its bills annually, one must be prepared for a year long commitment. As for Marketo, there doesn’t appear to be any contractual commitment with them. However based on reviews found on G2Crowd, one should be prepared for a one to two year commitment with them as well. HubSpot and Marketo provide the fundamentals in their basic packages such as email marketing, content creation, and market analysis tools. And while knowledge of HTML is a plus, it is not needed to work with either company’s software. What drew my eye wasn’t the difference in their package offers as much as the support offered with them. Being a part of HubSpot means one has access to their library, academy and blogs. One can also integrate social media into their marketing strategy, but it is limited to Facebook, Linkedin, and Twitter. Finally, for those who prefer a human touch, there is a customer support service. Marketo does have a customer support service, research center and a blog, but instead of a training academy, they have webinars, a calendar of events, and a community forum. The calendars of events shows where and when conferences are being held in the US. Neither company tells exactly how the onboarding process works, but they do list the support one will receive with their package. For HubSpot’s Enterprise package, one will have the support of a Senior Customer Success Manager, Senior Implementation Specialist, technical support with the set up and integration of other marketing technology, guidance in implementing one marketing campaign, access to the HubSpot Support Team, and access to the HubSpot Academy Team’s resources. For Marketo’s Launch Pack implementation package, one receives creative services support, hands on training, one on one consulting, and assistance with set up and configuration. According to Marketing Automation Insider, Marketo has three major shortcomings. The first is their landing page builder is still a remnant of their lead management tool, thus it is difficult to use. The second is the program is slow in producing report results and analytical reporting. What I have gleaned from reading the reviews, this is expected for large reports but not small ones. Lastly are the steep price jumps as seen in the pricing section. Another shortcoming I noticed from the reviews is the email builder is need of an update. As for HubSpot, Marketing Automation Insider lists their shortcomings as having most of their tools being free elsewhere, requiring a year contract, a price creep which becomes steep very quickly, having to pay for ongoing technical support, and having the A/B testing being available only in their enterprise package. In my readings reviewers noted that there can be a steep learning curve especially for newcomers. Multiple reviewers, on both G2Crowd and Trustradius, mentioned how one should be fully aware of their goals and what their own company needs. This is due to changes being difficult to implement in both marketing automation platforms. Despite HubSpot and Marketo providing very similar services, it is clear that each are different in their own way. Which platform is better will entirely depend on a company’s needs and goals. Hey John great summaries here. 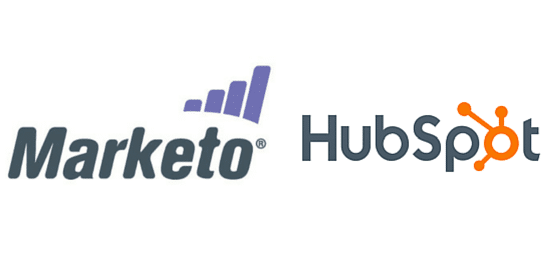 I haven’t Hubspot before but did want to add one first hand experience about Marketo. I’ve recently starting maintaining a lot of the marketing automation at my company. I now understand why marketing automation is a full time job at most companies. The community forums and support have been real helpful in quick trouble shooting. In most cases I could have spent multiple hours figuring it out on my own, but I typically can get pointed in the right direction for a resource same day using a forum, and if I’m submitting a ticket it’s handled rather quickly.